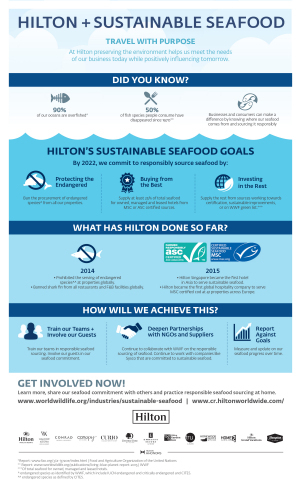 Hilton Worldwide (NYSE: HLT) reinforced its commitment to the environment by announcing multi-year sustainable seafood goals on World Oceans Day. In collaboration with World Wildlife Fund (WWF), Hilton has committed to implementing strong, global sustainable seafood goals in conjunction with the company’s Travel with Purpose strategy, which was launched in 2011 to use Hilton’s passion for hospitality to make a lasting, positive difference in people’s lives and the wider world. Travel with Purpose is Hilton Worldwide's corporate responsibility commitment to providing shared value to its business and communities by creating opportunities for individuals to reach their full potential; strengthening communities where Hilton Worldwide operates; and preserving environments through the measurement, analysis and improvement of the company's use of natural resources. Visit cr.hiltonworldwide.com to learn more. Hilton Worldwide (NYSE: HLT) is a leading global hospitality company, comprising more than 4,660 managed, franchised, owned and leased hotels and timeshare properties with nearly 765,000 rooms in 102 countries and territories. For 96 years, Hilton Worldwide has been dedicated to continuing its tradition of providing exceptional guest experiences. The company's portfolio of 13 world-class global brands includes Hilton Hotels & Resorts, Waldorf Astoria Hotels & Resorts, Conrad Hotels & Resorts, Canopy by Hilton, Curio – A Collection by Hilton, DoubleTree by Hilton, Embassy Suites by Hilton, Hilton Garden Inn, Hampton by Hilton, Tru by Hilton, Homewood Suites by Hilton, Home2 Suites by Hilton and Hilton Grand Vacations. The company also manages an award-winning customer loyalty program, Hilton HHonors®. Hilton HHonors members who book directly through preferred Hilton channels have access to benefits including preferred pricing, free standard Wi-Fi, as well as digital amenities that are available exclusively through the industry-leading Hilton HHonors app, where HHonors members can check-in, choose their room, and access their room using a Digital Key. Visit news.hiltonworldwide.com for more information and connect with Hilton Worldwide on Facebook, Twitter, YouTube, Flickr, LinkedIn and Instagram. Italian firm Comiflex SRL has shaken hands with India’s largest global flexible packaging solution company Uflex Limited confirming its intent to manufacture Gearless C.I. Flexo Printing Machines under a Technology Transfer Agreement with the latter. This happened at DRUPA where Uflex is currently exhibiting. The memorandum of understanding has already been signed between Mr. Gianfranco Nespoli, Owner of Comiflex SRL and Mr. Ajay Tandon, President & CEO, Engineering Business, Uflex Limited. Uflex will market and sell these machines across the world. With 50 years of enriching experience to his credit, Mr. Gianfranco Nespoli, is a renowned exponent in the field of designing and producing high quality C.I. Flexo Machines. Mr. Nespoli is one of the founding members of Flexotecnica that was founded in 1979 in Galganano for manufacturing flexo printing presses for roll to roll printing on films and paper for packaging applications. 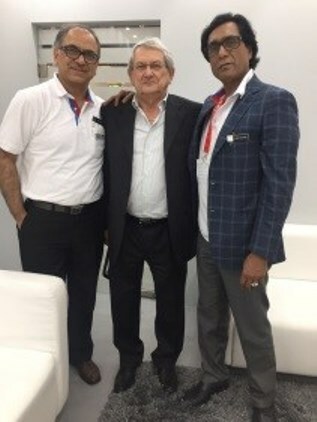 Expressing his pleasure, Mr. Ashok Chaturvedi, Chairman and Managing Director, Uflex Limited, who is currently attending DRUPA said “We will be manufacturing Gearless C.I. Flexo Printing Machines in collaboration with Comiflex SRL at our Engineering Plant in India. I am glad that Uflex has partnered with one of the sharpest brains of the C.I. Flexo printing machine technology. Innovation to create value added differentiation is the guiding principle at Uflex and our engagement with Mr. Gianfranco Nespoli’s Comiflex SRL testifies it”. “This tie-up furthers the ethos and spirit of my Government’s flagship scheme Make in India,” added Mr. Chaturvedi. Some of Uflex’s clients on the global turf include P&G, PepsiCo; Tata Global; Mondelez, L’ Oreal, Britannia, Haldiram’s, Amul, Kimberly-Clark, Ferro Rocher, Perfetti, GSK, Nestle, Agrotech Foods Coca-Cola, Wrigley, Johnson & Johnson among others. Mumbai is due to host a seminal foreign policy event, “The Gateway of India Dialogue: Where geopolitics meets business”, on 13-14 June. The event is co-hosted by the Ministry of External Affairs and Gateway House, the foreign policy think tank. The conference will feature a range of prominent foreign policy, trade and security issues. This is the first time that such a high-level foreign affairs conference is taking place in Mumbai. The city is India’s commercial capital and accounts for substantial foreign trade by both value and volume. The Gateway of India Dialogue event will bring together an Indian and international audience consisting of senior union ministers, leading industrialists, foreign ministers from neighbouring countries and policy experts. The two-day event will be inaugurated by S Jaishankar, Foreign Secretary, who will also deliver a keynote address on “Aligning Business and Strategic Goals”. Central ministers Dharmendra Pradhan and Kiren Rijiju, as well as a broad range of panellists, will be addressing diverse issues such as global capital, the politics of energy, international trade agreements and cybersecurity. Several senior international ministers are due to participate in the high-level meeting. These include Kamal Thapa, the Nepalese Deputy Prime Minister and Foreign Affairs Minister, and Canada’s former Minsiter of Citizenship and Immigration Christopher Alexander. Global subject matter experts will drive the panel discussions, including Narendra Karmarkar, the creator of “Karmarkar’s algorithm”, who will contribute to the cybersecurity panel. Leading industrialists like Adi Godrej and experts led by Mohandas Pai, Anshu Jain, and Manish Sabharwal will offer the business perspective on the same subjects. Further amplifying Mumbai’s increasing relevance to the foreign policy debate, the city is also playing host to “T20: Dialogue on Global Economic Governance” on 13 June. The event is the official sub-forum of the G20 process, responsible for contributing ideas and research to the G20 on global economic issues. T20 will be attended by experts in international economics from over 30 leading think tanks from across Southeast and South Asia as well as from G20 countries. T20 and Gateway of India Dialogue delegates will be attending and speaking at each event respectively, adding their expertise to both. Commenting on these forthcoming events, Manjeet Kripalani, Executive Director of Gateway House said: “Geopolitics and international trade are closely linked. Mumbai is already known as India’s commercial capital and its business community should have a seat at the table when discussing strategic geopolitical affairs. Gateway House is delighted to offer the platform for this to happen through these events”. Greetings on behalf of KPIT Technologies! Please find enclosed & attached the press release on KPIT announcing the third edition of national design and innovation contest – KPIT Sparkle 2017. The contest is aimed towards providing a platform for engineering and science students from across Indian colleges to use technology to address real world challenges in Smart Transportation and Smart Infrastructure. Students and colleges who come up with the most innovative cutting-edge solutions within the theme will be awarded prizes worth over 20 lakhs. Registration and submission for the contest is now open and closes on July 15, 2016. Shortlisted participants will exhibit their ideas at the grand finale. मुझे लगता है कि उस अधिकारी को अस्पताल ले जाने से पहले इस तरह का प्राथमिक उपचार हुआ होता तो वो बच जाता। अगर ऐसा ही फिल्मी कलाकार संजीव कुमार के साथ हुआ होता तो वो भी बच जाते। शफी ईनामदार, अमज़द खान भी हृदयघात से ही मरे थे। उन्हें भी प्राथमिक उपचार मिला होता तो वो आज ज़िंदा होते। अगर लोग गाड़ी ढूंढ कर अस्पताल ले जाने की जगह पहले सावित्री आसन की विद्या को प्रयोग में लाए . Each year the special days keep coming to celebrate the different relations but what actually make it special are the efforts you put in. Father’s day celebrate the bond of unspoken thanks and respect that kids share with their father. Go for the individual items, hampers or combos with the varied gift options from "GiftsbyMeeta.com" under different category that suits your budget. Unique and smart father’s day gift ideas have got the comfy items like cushions, mugs, coasters and car accessories to make the days smoother. A special section for the personalized gifts, office, home and travel gift would give the quick navigation for the father’s day online shopping. Hampers and gym essentials are also in the collection for the refreshing daily routines with car baskets to have ample supplies during the office travels. The father’s day gift shop is here to make the days well groomed for your dad and granddad with the leather accessories for office and gathering. The watch organizers, belts, wallets and tie cases will give the well managed hours with classy look to turn the heads. This fathers day give your dad this pack of perfume from Numero Uno senses. It comes with a love tag. Keep your money safe with this durable money bag or cash box. It comes with a creatively designed greeting card. One soft towel and perfume from Ralph Lauren, one dark spot reduction face wash from Nivea Men and t lights for your dad. The 6 inches high and 5 inches wide designer notepad with a beautifully printed 3.5×3 inches black mug are an ideal gifting option to give to your dad. This father’s day gift this to your dad and tell him how much you love him. One 130g pack of chokola milk rochers that includes roasted cashew nuts and almonds napped in milk chocolate, one 12 x 12 inches soft cushion featuring a love quote on it and one 3.7 inches high white mug with a fine print on it for your dad. One love tag also included in this combo. The notebook specially made with eco friendly material with deo from United Colours Of Benetton UCB and one love tag for your dad. Crocs unveils its brand new versatile Citilane collection for men and women. Be it a casual weekend with boys or a fun brunch with girls, the Citilane collection has the perfect pick for every relaxed occasion. Under this range Crocs presents Citilane Clog, Citilane Flip, Citilane Roka and Citilane Flat (Women). All varieties designed to provide utmost comfort to your feet and make them feel breathable. The brand new Citilane clogs are composed of elastic gores for easy on and off. The Croslite foam construction gives you light-weight cushion you’re looking for. Citilane Flips with soft TPU toe post along with Croslite foam foot bed and outsole provides you double comfort. The Citilane Flats for Women with Croslite foam construction, twin stretch gore panels and micro fiber heel patch give you the utmost comfort that every girl desires for. The Citilane Roka collection made up of soft upper mesh combined with classic sneaker looks and twin gore stretch panel makes it even more stylish and comfortable. Think of the Citilane collection as a perfect merger of Crocs’ comfort and classic vintage sneakers. Available in a variety of colours, this collection is designed to become an instant choice with the urbane. The slimmer and modern look of the collection makes it a perfect pick for any casual ensemble. So rush to your nearest stores and grab a pair of Crocs Citilane collection or log on to www.shopcrocs.in. Aspri Spirits celebrating Father’s day with a Hamper full of Love! A Hamper full of Love! A classy man deserves a classy gift. Aspri Spirits puts together the best combination of spirits in a hamper for a son’s first hero and daughter’s first love- DAD. The Hamper consists of spirits in three different categories and grouped them into a manageable collection of fine spirits that will surely be the best gift to bring in the celebration of Father’s day. Patrón Silver tequila appeals to drinkers looking for the perfect ultra-premium white spirit.Using only the finest Weber blue agave, it is handmade in small batches to be smooth,soft and easily mixable. Each bottle is individually crafted by a glass artisan from recycledglass and is hand-numbered. These commitments to excellence–from the liquid within to the outer container–helps make Patrón Silver one of the top-selling ultra-premiumwhite spirits in the world. CAMUS owes its international reputation to the rich and subtle flavors of its Cognac that appeal to all the senses. Perpetuating the distinctive styles of the House of CAMUS is the Cellar Master’s responsibility, blending eaux-de-vie from different crus and of different ages with technical virtuosity, inspiration and intuition in equal measures.Camus VS is a fresh and lively Cognac, true to the original character of the vine. In the journey from grain to glass all Stolichnaya® vodkas undergo a remarkable transformation. Elevating centuries of vodka tradition to high- tech art, elit® by Stolichnaya® is the inception of ultra- luxury vodka. The result is a spirit of breathtaking clarity and flawless molecular composition, born from an obsession with accuracy. Visibly luminous in the glass with a weighty, rolling mouth- feel, elit® by Stolichnaya® exudes pleasure like no other vodka. Consistently commended as the highest rated vodka in the world, elit® can be enjoyed chilled, on the rocks or in a meticulously executed martini. Patrón Silver, Camus VS & elit® by Stolichnaya®are available across all leading stores and bars. Sunny Leone will be soon seen in a brief role in a romantic-drama film titled Luv U Alia. The movie will be releasing on 17th of June and Sunny will be seen grooving to a special song along with a young actor. The song titled Kamakshi sees Sunny Leone in a fun and quirky avatar dancing away to the tune. The makers have released few sizzling pictures of Sunny Leone from the movie which definitely are a treat to the eyes. Luv U Alia, which features Ravichandran, Sangeetha Chauhan and Bhumika Chawla in the lead roles, also has actor Kiccha Sudeep in a cameo. It gives a pleasure you to inform that EPH journal is going to bring its next issue of June, 2016. You are welcome to send your papers to EPH Journal at submission . EPH is a giant publisher in various field of engineering and technology, social science, management, medical science and pharmaceuticals research and many more. You can send your paper to us, the response will be given within 24 hours. EPH process a paper with peer reviewed method, and is very strict about fake research papers. The notification of review process given to author within 5-7 days after submission of manuscript. Feel free to contact us for any kind of issue related to publication.